PALM BEACH, Fla. – March 2, 2016 – Barrett-Jackson, The World’s Greatest Collector Car Auctions®, is heading to Palm Beach, Florida, for the company’s 14th Annual Palm Beach Auction from April 8-10, 2016, at the South Florida Fairgrounds. This year’s docket will feature a broad range of vintage, custom, supercars and late model vehicles. Some early consignments include a rare 1957 Ford Skyliner F-Code Retractable Hardtop (preview) and an extremely low-mileage 2006 Ford GT Heritage Edition still in the wrapper (preview). Among the hotly anticipated vehicles is an exceptional 1957 Ford Skyliner F-Code Retractable Hardtop (preview). This Skyliner is one of only seven Fairlane 500s built with a supercharged F-Code 300 brake horsepower, 312ci overhead-valve V8 engine with a retractable hardtop. The original owner campaigned this vehicle at top-level drag races and won the national championship for its class in 1957 and 1958. A 1957 Ford Thunderbird F-Code Convertible (preview) is the perfect complement to the 1957 Skyliner. This F-bird is one of only 205 also fitted with the supercharged F-code 300 brake horsepower, 312ci overhead-valve V8 engine. It has been meticulously restored and is finished in a rare Flame Red exterior. Supercars are always among the most sought-after vehicles in Palm Beach. 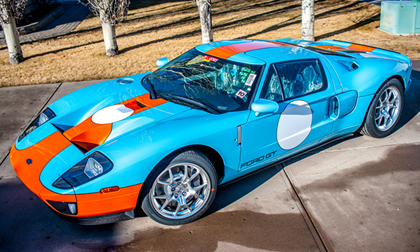 This year’s docket features a 2006 Ford GT Heritage Edition (preview) still in the wrapper. With less than 5 actual miles on this vehicle’s odometer, finding one of the 343 Heritage Editions this pristine is extremely rare. Also included in the Palm Beach auction docket is a 2005 Porsche Carrera GT (preview) mid-engine supercar putting out 605 horsepower with its 5.7-liter V10 and 6-speed manual transmission. Only 1,270 units of the Carrera GT were ever produced, making this a rare opportunity to own one of the most sought-after supercars. Established in 1971 and headquartered in Scottsdale, Arizona, Barrett-Jackson, The World’s Greatest Collector Car Auctions®, is the leader in collector car auctions and automotive lifestyle events. The company produces auctions in Scottsdale, Arizona; Palm Beach, Florida; at Mohegan Sun in Connecticut, and Las Vegas, Nevada. With broadcast partners, Velocity and Discovery Channel, Barrett-Jackson will feature live television coverage in 2016, including broadcasts in over 100 countries internationally.Barrett-Jackson also endorses a one-of-a-kind collector car insurance for collector vehicles and other valued belongings. For more information about Barrett-Jackson, visit http://www.barrett-jackson.com,or call 480-421-6694.